The gap between the ‘haves’ and the ‘have nots’ has moved to the centre of the political agenda in post-Brexit Britain. In Theresa May’s first speech as prime minister, she stood on the steps of 10 Downing Street and pledged to ‘make Britain a country that works not for a privileged few, but for every one of us’. Owen Smith has vowed to rewrite clause IV of Labour’s constitution ‘to put tackling inequality at the heart of everything that we do’. And Jeremy Corbyn has launched his leadership re-election campaign with a promise to tackle the ‘five ills’ of 21st century Britain – ‘inequality, neglect, insecurity, prejudice, and discrimination’. One central form of inequality in Britain – and one not directly cited in those speeches, however – lies in citizens’ participation in the political process, with millions regularly not voting in elections. They don’t do so for many reasons. Having no party or candidate to inspire them to turnout comes high up the list. But the causes are often less a result of their own reasoning. Decisions were made in 2015 not to enfranchise 16 and 17 year-olds and non-British EU nationals for the recent referendum. These two groups were probably the most pro-European. Allowing them to vote could have altered the outcome drastically. A further overlooked group of citizens who don’t participate are those who are legally enfranchised, but not registered to vote. The latest systematic estimate is that there were around 8 million people were missing from the electoral register in December 2015. Unlike in countries where registration is automatic – or even possible on polling day – the UK requires applications to be made in advance with citizens providing their National Insurance number and date of birth. Of course, many of these people have little intention of voting. But not all. A study of the 2015 general election revealed that two-thirds of polling stations turned away would-be voters who thought that they were on the roll, but weren’t. There is large scale confusion among the public about their registration status. Many think that they are registered (because they pay council tax or use other government services) when they are not, research shows. 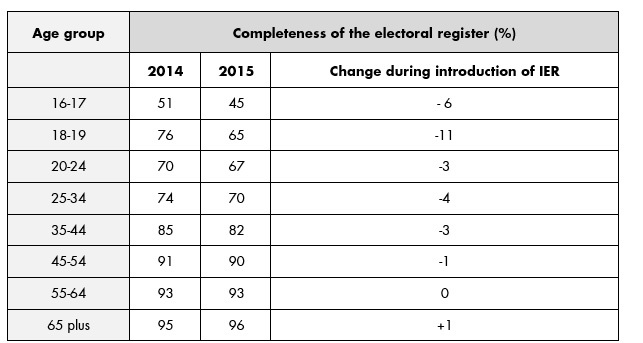 Levels of electoral registration are highly uneven. The evidence is that the register is less complete in urban areas (especially within London), amongst recent movers and private renters, Commonwealth and EU nationals, non-white ethnicities, lower socioeconomic groups, citizens with mental disabilities and young people. This matters more than ever before because this is the register on which the boundaries for the 2020 general election will be drawn. These groups will have less representation in the UK Parliament than others. Democracy will suffer as a result. More troubling is that amongst some of these groups registration rates are declining sharply. Table 1 charts out the proportion by age groups between the 2014 and 2015 register. Less than half of ‘attainers’ – the next generation of voters – are on the register, but nearly everyone over-65 is. But this is a situation which has worsened during the implementation of individual electoral registration (‘IER’) – a system that made it an individual’s responsibility to register to vote and asked them to provide their National Insurance number. Research forecast that the registration rates of young people would be adversely affected and warnings were issued to (and made in) parliament. The government did introduce online voter registration and provided extra funding for voter outreach activities. But this was not enough. And as regards the latter, it was alway too little, too late. Earlier in the year, the All-Parliamentary Party Group on democratic participation published its first report setting out a 25-point strategy called ‘Getting the ‘Missing Millions’ on the Electoral Register’. This included proposals such as an online system to enable citizens to check their electoral status as well as automatic voter registration (‘AVR’) for many groups. It asks straightforward questions. Why not register 16 year-olds when they receive their National Insurance number? Why isn’t registration part of every school’s citizenship provision? And if we know it works overseas, why don’t we (at least) pilot AVR in Britain? The report received much support and was widely praised in parliament by MPs such as Owen Thompson and Louise Haigh, and by peers (including APPG co-chairs) in the Lords. Open letters (most recently in the Telegraph) have been signed calling for action. The Electoral Commission has supported many of the proposals. The former minister, John Penrose, has said that the report was ‘helping inform our plans for a programme of work aimed at realising this vision’ and policies have been promised. The Government is now introducing a system to pilot automatic voter registration in Ryedale, Birmingham and South Lakeland. An alliance of civil society, academics and politicians have made this very real difference. But there is much more to do. The rationale and detail of the pilots remains unclear. Why for example, were these three local authorities chosen? Who was involved in that decision? To what extent were social science research criteria involved? What sources of public data will be used to enroll citizens? Why were some sources used and not others? The benchmarks for success have not been defined. How many additional registrations would AVR need for the government to deem the it ‘worthwhile’? The Electoral Commission evaluation will need careful reading and focus should continue. Moreover, there are many other steps in the report that can be introduced more quickly by UK governments, civil society and campaigners; the incorporation of registration in schools being a long-overdue ‘easy win’. The June electoral register saw a record spike thanks to interest in the referendum and the hard work of campaigners, such as those involved in #TurnUp. But our ‘Missing Millions’ report documents that electoral services are under-resourced and under-strain. And let’s not forget – millions of eligible voters are still missing from the UK’s electoral register. And so as the pieces begin to fall into place in post-Brexit Britain, building a modern and efficient system of electoral management is essential for getting the missing millions securely on to the register, and into the UK democratic process. This is how Theresa May can begin to close the gap between the ‘haves’ and the ‘have nots’. And this is how she – and indeed the next Labour leader – can truly begin to put words into action in creating an inclusive, equal and fairer democracy. Oliver Sidorczuk is an activist and advocate for democratic reform. Until recently, he managed Bite The Ballot's policy work and convened the APPG on Democratic Participation. He is a now studying at UCL's School of Public Policy and working in the House of Lords.